Nothing is better than the aroma a loaf of homemade bread baking in the oven. 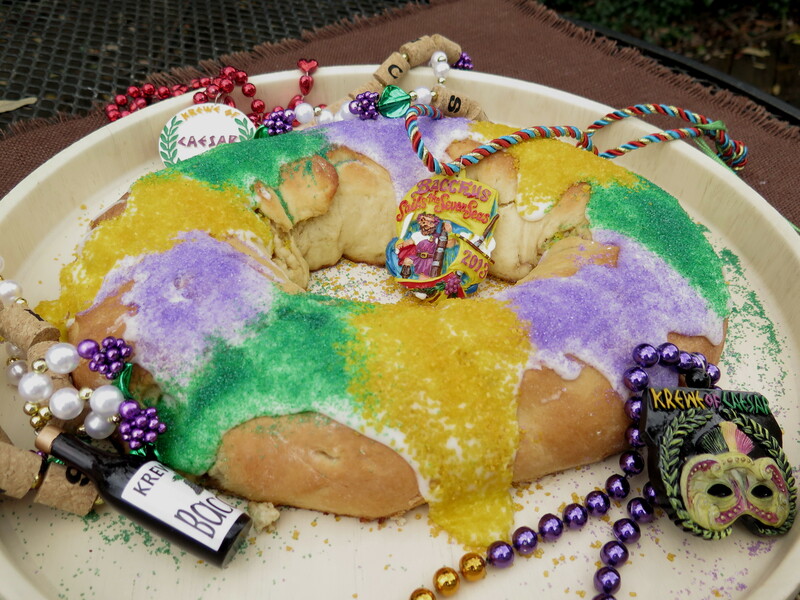 A Mardi Gras King Cake is a rich, sweet yeast bread. It reminds me of a Swedish Tea Ring or Danish Coffee Cake. Baking bread by the traditional method can be a time consuming process. Through much practice, I’ve developed a system that speeds things up and makes bread baking much easier. Since it’s Mardi Gras time and carnival season here. I’ve brushed up on my bread-making skills. Here are a couple of tips learned along the way. Bread requires a great deal of time in kneading to develop the gluten in the protein, so that the dough will rise and keep it’s structure while it bakes. With that in mind, it is worthwhile to use at least part of the flour with one specifically made for breadmaking–it has a higher gluten content. To cut down on the time of kneading by hand, I make the bread dough in a food processor. I tried using a mixer, but my old Sunbeam mixer wasn’t strong enough and froze up. Early on, I invested in a Cuisinart food processor which has a dough attachment. All food processors are not the same. If you are planning on purchasing one; check out the reviews to make sure it will handle bread dough. Ideally, I’d use a Kitchen Aide mixer. These are designed for heavy-duty tasks such as making bread dough. I purchased a Kitchen Aide mixer for my son–he moved away. I’m pleased that he’s using it (yes, college students can cook) and has made many variations of bagels with the mixer. Use a yeast package that has not expired. Although this seems obvious, it wasn’t to me. I’ve watched bread sit on my counter top for several hours not rising; only to discover that the yeast was old. Yeast may be dormant, but it is living–trust the expiration date printed on the label. I use Rapid Rise yeast, as I like to get a jump-start on things. 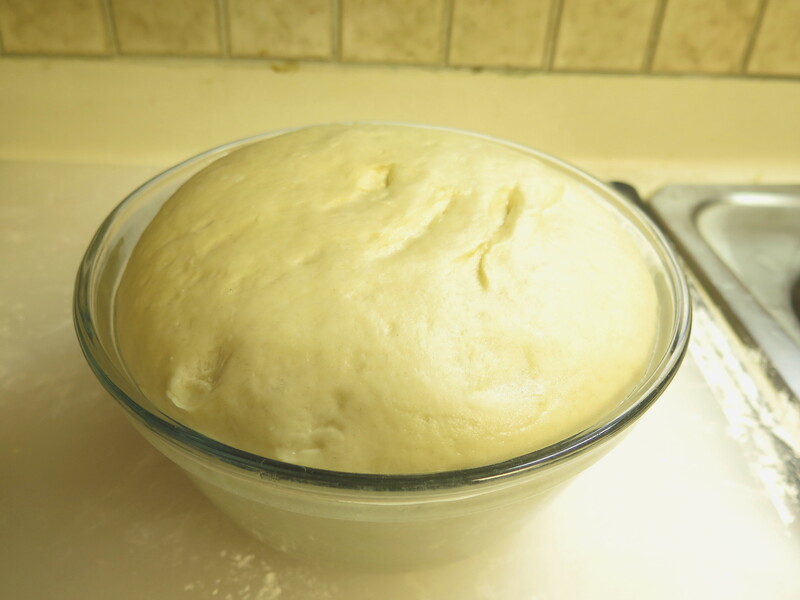 This time, the dough rose to double its size in 45 minutes! Pretty impressive. The second rising took less that than. Purchasing an inexpensive pocket thermometer is a wise investment. 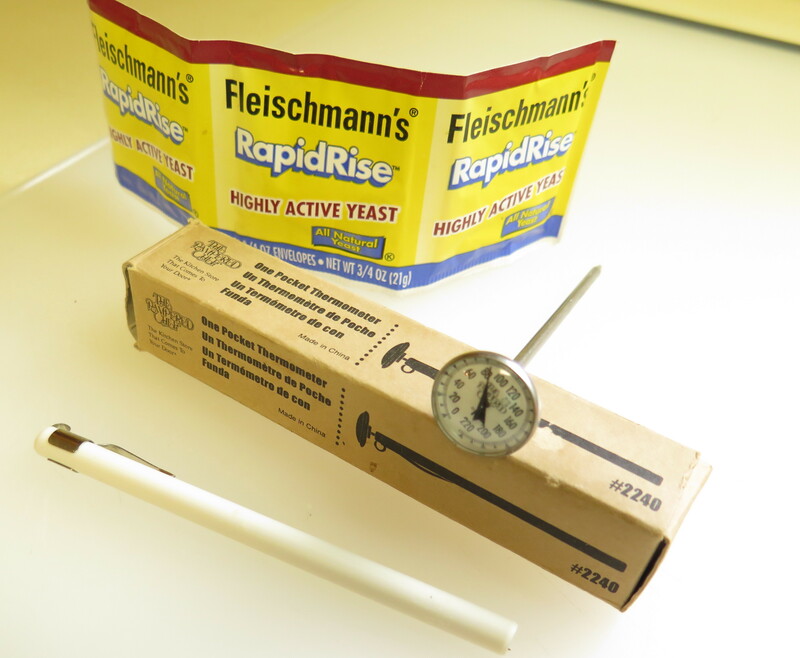 Yeast needs to be between 120-130 degrees F. to begin growing. Higher temperatures will kill the yeast; at lower temperatures, the yeast won’t grow. Dough needs a warm place to double in size. In the winter, I turn on my oven and let the dough sit on top of the stove. (I have a convection oven that allows the heat to rise up the center of the burners.) In the summer, I avoid drafts of the air conditioner. My son says he puts the dough in the engine of his car–that probably works if you can keep the dough clean. King Cakes found at Mardi Gras time, are rich, sweet yeast breads. MIne contain eggs, a a little more margarine and sugar that a recipe dinner rolls. Often king cakes have fillings–imagination is the limit here. For one filling I used a cherry and almond filling with cream cheese. (For this filling I thickened the juice of a can of tart cherries with 3 T. sugar, 1 T. cornstarch, 1/4 tsp almond extract by heating this on the stove. Then I added back the cherries. I softened the cream cheese and added 1/4 cup sugar and 3/4 cup finely chopped almonds). For the second filling, I used 2 cups finely diced apples, mixed with 1 T. lemon juice, 1 T. margarine, 1/4 cup brown sugar, 1 T. cornstarch–cooked for several minutes on the stove on low heat. My recipe makes two large king cakes. Mix 1 cup flour, 1/2 cup sugar and 2 packages of Rapid Rise yeast and 1/2 tsp. salt in bowl of food processor (or heavy-duty mixer such as Kitchen Aide). Set aside. In medium saucepan on stove, combine 2/3 cup water, 2/3 cup milk and 1/3 cup margarine. Stir until these liquids reach 120 – 130 degrees F. They should be very warm but not too hot. Use a thermometer to measure the temperature. Pour these liquids into the flour mixture in the food processor. Process for a minute or so. Then, let these set for about 5 minutes so the yeast begins to grow. This is called a sponge method of making bread. The yeast will bubble. Add 1 additional cup of flour and 2 extra large eggs, beating well after each addition. Then add 2 additional cups of flour-one at a time. 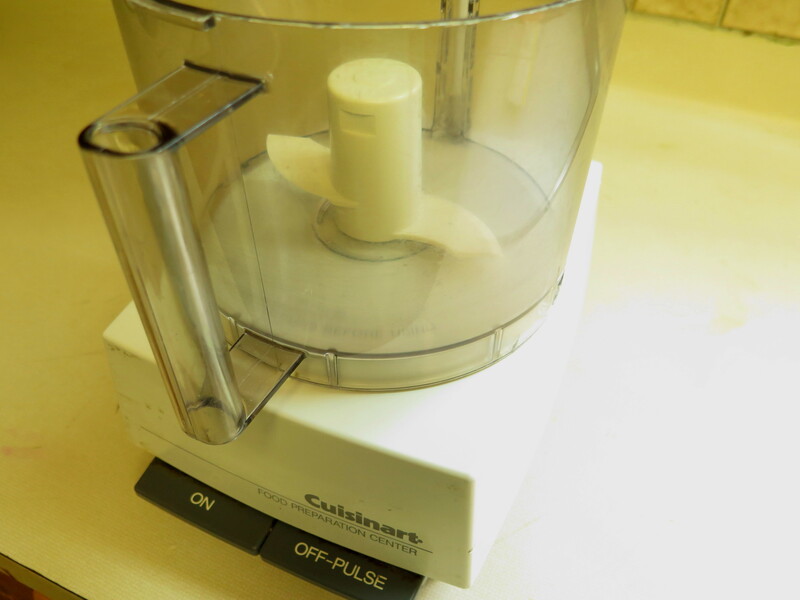 Process the dough with on-off motion. 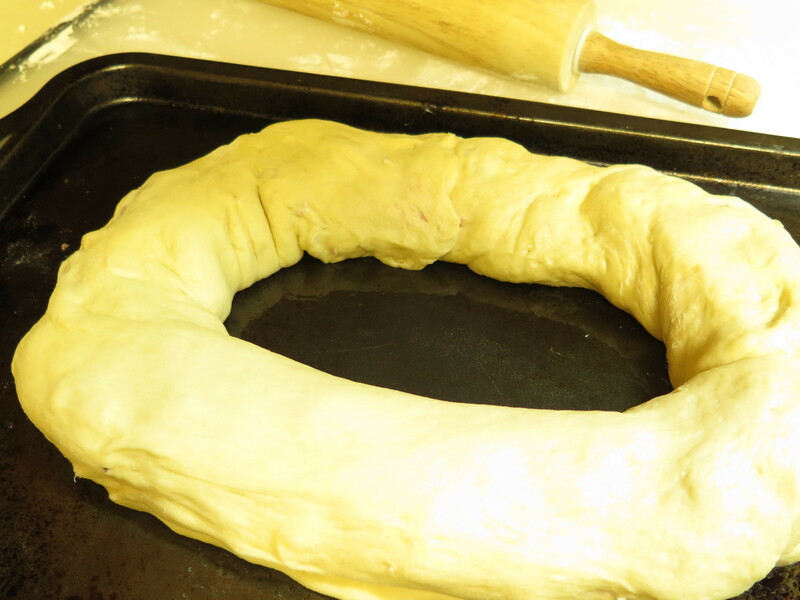 The dough may be sticky–as shown below. If it is, add additional flour, 1/4 cup at a time, until the dough pulls away from the sides of the food processor. Process fo r several more minutes. 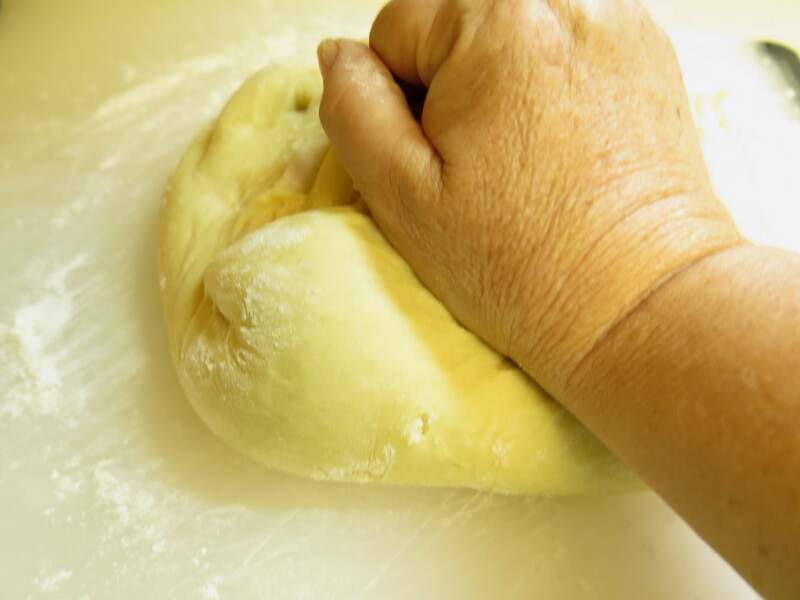 Turn the dough out onto a floured board, and knead by hand, using the heal of your hand until the dough is smooth and shiny. 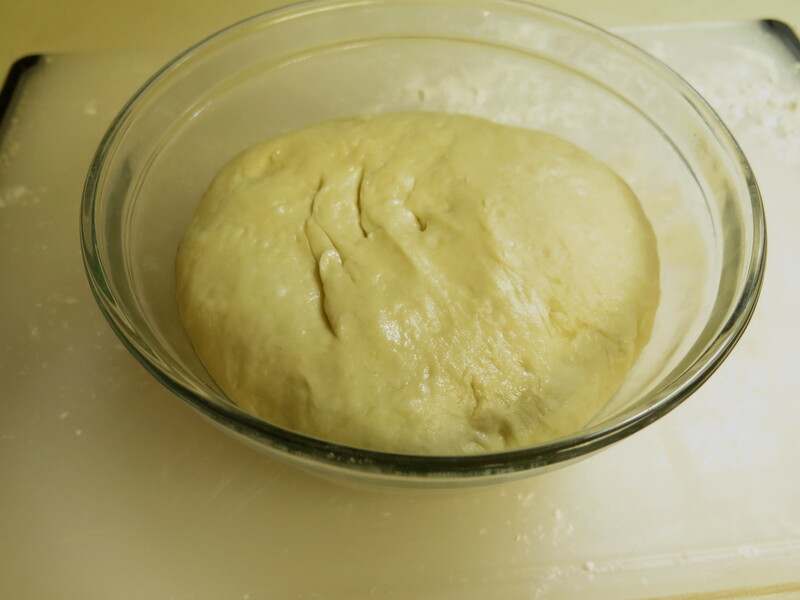 Place in an oiled bowl, one that will allow the dough to double in size, but not a bowl that is overly large. Cover with damp towel, and set in warm place to rise. When the dough has doubled in size, it’s time for the next step. Punch the dough down, divide in half. Repeat the following steps with each half. 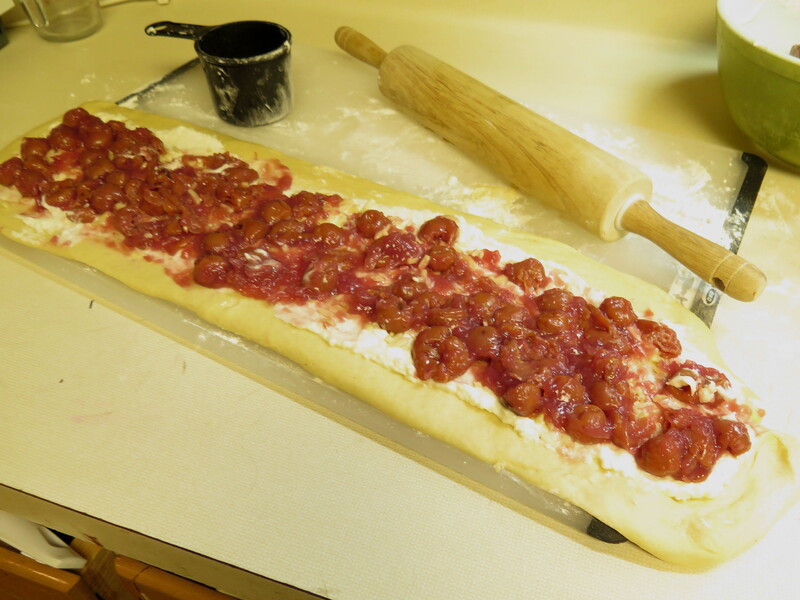 Roll one half out with rolling pin into a long narrow (6″ wide) rectangle. Place filling on top. Roll up into jelly roll, seal edges with your fingers. Transfer to oiled baking sheet shaping into an oval; overlap the ends and place the sealed edges down on the baking sheet. Cover and let rise a second time, until almost double in size–it will continue to rise while baking. Bake at 350 degrees for 20 minutes. Make a glaze of 3 cups powdered sugar, 1/4 cup milk, 1 tsp vanilla. Stir and whip these ingredients until glossy. They glaze should be very thick. Drizzle glaze over top, sprinkle with green, purple, gold colored sugar or sprinkles. Cut and serve. Best when freshly baked. Enjoy. The first flowers in my garden every year are pretty, yellow Confederate Jasmine growing on a vine and fragrant grape hyacinth from bulbs that come up every year. It will be spring soon. 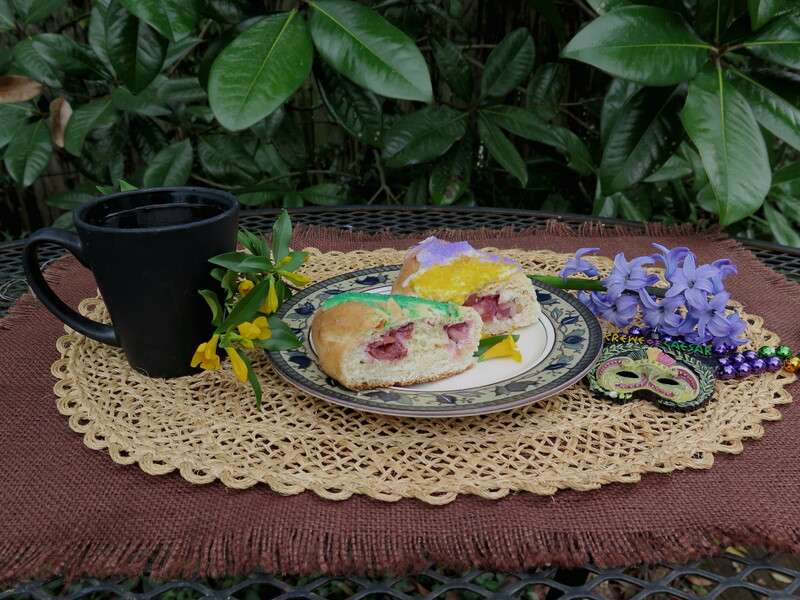 This entry was posted in Louisiana Culture, Recipes and tagged baking bread, Mardi Gras King Cake by Maylee at Beyond Gumbo. Bookmark the permalink.